Another day, another poll. Decent numbers as well. This final is going to be very close. The odds should be closer than they are - excepting Lisa of course. 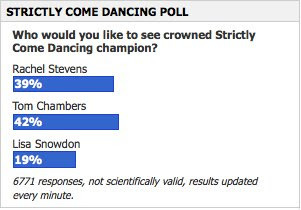 As said before, betting on the night on who you think is the best dancer on the night seems to be the best option. If he makes the final (he will) I am going to go back in on Tom just before his final dance as I think his odds will plummet. The question then is lay off or not on Betfair? Another Terrible TV Ratings Bet? Strictly Come Dancing: Tomcat Gets The Cream! The Really Early Pointer To The Winner? Strictly Come Dancing: What to do? The TellyBetting Blog: Help Wanted!